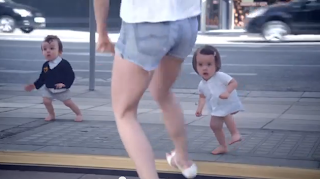 Evian knew they were on to something when the first "baby" viral came out in 2009. On the official Evian link alone they have almost 67 million hits, and people are still talking about it. This is the classic definition of the act of branding. It doesn't talk about the water. It doesn't mention anything about the health benefits of water as an ad category. It just rips it up with adorable computer composited babies for 60 seconds with the Evian billboard beginning and end. Hey, if your product already has brand acceptance, it's about turning it up to the next notch right? I know, I know, this doesn't clearly adhere to the golden rule "build your entertainment around a product sell point". But 67 million plus impressions on a product that is all about perception is reason enough to stray from the rule book yes? Evian babies is the technical progeny of MP, a 25 year old visual effects shop whose client list is a who's who of commercial and film professionals. And now the follow up has dropped and it was worth the wait. Yes the compositing is world class, but the editing also is superb. The reveals of each character are brilliant; either starting with the adult and then cutting to their doppel baby, or showing the adult first and then beat cutting over to the baby. I love this campaign. And with 35 million hits in less than a week, I'm not alone. Light painting has been around since man invented the camera. Or at least since man invented shutter speed for the camera. Light painting is when you extend the shutter speed to expose the sensor for a longer than normal period of time. At that time you can take a light source, move it around and create... well....magic. Imagine the look on the face of the person who first accidentally produced a light painting image. He or she must have thought demons had invaded the inside of the camera. 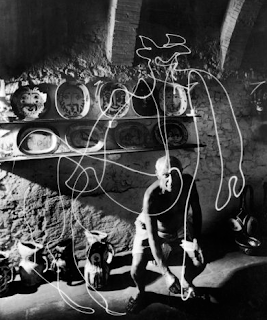 Famous light painting artists include Picasso, who in a legendary series done in 1949 was documented in Life Magazine. It's what kept Picasso relevant, always reaching out to new mediums. You can rest assured if he were still alive today he'd have a tablet in his studio mastering digital painting. Here's a site with more examples and background on light painting. Light painting is like any other type of photography; your result is only limited by your imagination. I can thankfully say I haven't been to a laundromat in years. But after seeing today's first commercial, I may "accidentally" trip over the power source and load up for the nearest one. Gum. It's kept jaws busy since the time of the ancient Greeks who chewed the resin from the Mastic tree. It has provided nervous jaws something to do, and allowed one the opportunity to express him/herself through the size and pop of the bubble snap. Since Walter Diemer accidental stumbled on the perfect recipe for snap, pop and no crackle bubble gum in 1928, it's been a favourite of the chew set ever since. But whether it's bubble gum, or chewing gum, it's still a challenge to market. What makes the brand unique? Sheldon Cooper of Big Bang Theory had his own ideas about this before, well, before he became Sheldon Cooper. Here's Jim Parsons in the 2006 commercial for Stride Gum. And here's a bit of a bizarre commercial with a definite English flavour to it from Orbit gum. And another Orbit ditty featuring "food breath." The common denominator? Gum will get you some. It's not a new message. But it is definitely a message that won't end up on the bottom of your shoe. The movies. They have always been like a comforting old friend. The ultimate escape from whatever ails. And they've inspired many a Creative Excellence blog on Friday mornings. Roger Ebert escaped to the movies as film critic of the Chicago Sun Times since 1967. His type writer went silent yesterday after his final battle with cancer. His words so eloquent, he was always one of three critics I would base my hard earned movie going dollar decision on. If the triumvirate of Ebert, Peter Traverse and Richard Corliss of Time magazine all gave it the thumbs up, I would plunk my money down on the counter and know chances were excellent I was in for the thrill ride or the emotional departure I needed for that drug free fix of the week. 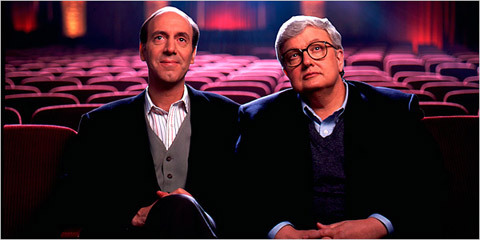 Roger Ebert lived his life with class and his words moved many far beyond his film recommendations. This passage from a few years back creates the perfect eulogy penned from his own mind. We can only hope that Gene Siskel took the time to have Roger's celestial seat in the balcony steam cleaned and put on a fresh batch of Orville Redenbacher.